Robyn Auld entered a radio competition in 1983 but her entry never made it. When 55-year-old Western Australian Robyn Liebeck received a call from her nephew's partner on Monday, she never thought it would lead to a moment 34 years into her past resurfacing on a state-wide radio program. Liebeck, who lives in the small farming town of Muntadgin 300km in-land from Perth, was busy at work on her property keeping up with the seeding season and unaware that an entire team at WA radio station 96FM were trying to find her. In 1983 Liebeck, who was then 22-year-old secretary and music fan Robyn Auld, sent a competition entry form on a milk carton cutout for the Brownes Dairy Choc Rock Contest to 96FM Stereo in the hopes of winning "a complete set of the Top 96 Albums" from the station. The entry never made it. Fast-forward 34 years and 96FM's Carmen & Fitzi finally received the entry through the mail and decided to kick-off the state-wide #FindRobyn chase to see who she was. 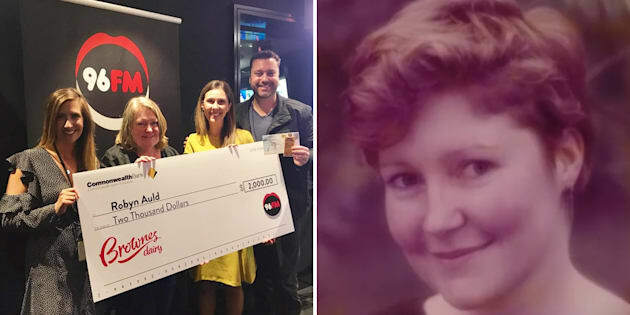 After numerous phone calls and a tip-off from her daughter, they found Robyn and she agreed to travel the large distance to Perth and meet the team only to be surprised with a $2000 cheque by Brownes Dairy -- the equivalent value of the 96 albums she could have won in 1983. So who is this elusive Robyn Auld and what was she doing entering competitions off the back of milk cartons multiple times? Turns out she's as big a music fan now as she was in 1983 when she was jamming to the likes of 'Mental as Anything', 'Cold Chisel', Michael Jackson's 'Thriller', 'Dire Strait's and 'Australian Crawl' while renting in Como, WA. "Music is what fills your day. Yeah music was pretty important. I liked it all, I liked all types of music," she said. "There was some great albums out there [in 1983]." After 34 years, and with Perth's help, WE FINALLY FOUND ROBYN! And as for the moment she found out that her entry had finally made it to its destination after 34 years? "I got a phone call from my nephew's partner and she said 'you're going to find out something, it's a competition, it's really amazing. I'll let them explain in,' and she hung up." "I didn't really take a lot of notice of it until Britt [her daughter] said 'this is kind of big-ish'." And by 'big-ish', she meant a blast from the past, 34 years in-the-making.